If you want something that’s a step up from the traditional yarn-head or sponge mops, you’ll want to browse our selection of the best spin mops. No electricity, batteries, filtered water, or warm up time needed! No more chapped hands from wringing out a yarn-head mop or back pain from bending over a bucket. Spin mops come in a variety of styles for every budget. 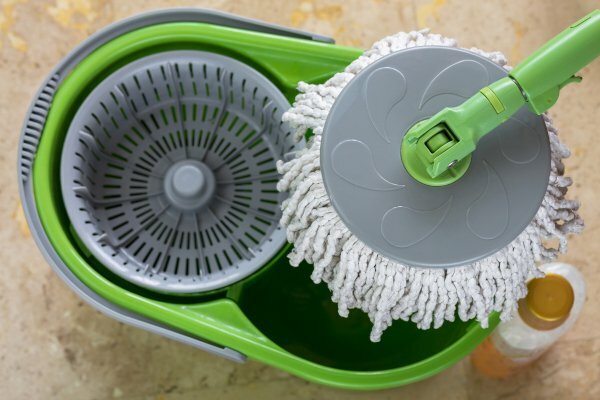 Our 2019 reviews feature some of the best spin mops on the market today from brands like Bissell, O’Cedar and newer brands like Mopnado. The size of your room(s): If you have a large kitchen and/or bath or hard floors throughout your house, a mop with a big spin head will probably save you some time. Mop head material: Most spin mops have microfiber fabric, which is gentle on floors and absorbent. However, some also come with scrubber brushes or other materials for heavy-duty jobs or ultra gentle cleaning. Handle length and build: Most spin mop handles are stainless steel or aluminum. Stainless steel is sturdier, but heavier. Also, if you’re tall, the length of the handle is important. Some models come with telescoping handles or extensions that can prevent back strain. Bucket design: These can vary widely. Ease of use is the key here. Look for a pour spout to make dumping dirty water easier. Splash guards will keep excess water from sloshing on your floors. A bucket with wheels will keep you from having to lift it so often. Also, some buckets have foot pedals for the spin action. These may or may not be great, depending on the model. 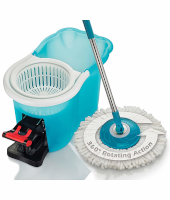 A powered spin mop with double spinning pads for multiple floor surfaces that propels itself. Worth the price for people with back pain. A simple mop with an innovative bucket that lets you control the level of moisture needed. Perfect shape and size for tight spaces and corners. An innovative design to make mopping a breeze. No bending required to wring or change mop heads. If you like all the main features of the Mopnado, but don’t like the price, the Hapinnex is a great alternative. Despite the hyped-up commercials, the current version of the Hurricane 360 spin mop isn’t that awesome. 14 inch wide mop head, 20 ft. power cord, 2 sets of spinning pads for gentle cleaning or scrubbing, trigger controlled spray. Inexpensive, foot-pedal spinner and splash guard in bucket, swivel head and triangular shape, telescoping handle. 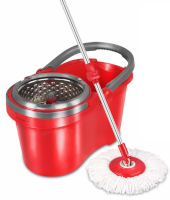 Agitator in mop bucket removes dirt well, handle extends to 56 inches, built-in detergent dispenser, scrubber attachment, extra mop head included. Drain spout in bucket, built in agitator to clean mop head, detachable detergent dispenser, non-slip handle. Affordable, lightweight, spins well, good for small rooms and tight spaces, 5-year replacement warranty. Expensive, propelling action could be hard to control, may leave streaks or pads may not absorb dirt depending on user. Too small for efficient cleaning of large areas, no extra pads included, no wheels on bucket, foot pedal may break after several uses. Takes some time and effort to learn how to operate it correctly, no replacement parts available, plastic can break if not used properly. Has a learning curve, may require more than one hand to operate spin action, won’t fit in corners well. Newer version is cheaper quality, no wheels, parts can break often, all add-ons like a roller dolly sold separately. 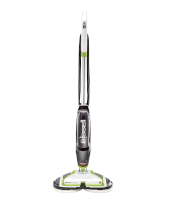 Bissell is one of the leaders in floor cleaning. The Spinwave is one of the few electric-powered spin mops. It’s not a steam mop, but it does have a tank to fill with water + cleaning solution. There are dual spinning pads in the Spinwave. There is also a cordless, rechargeable version. The mop head itself is 14 inches wide and the cord is 20 feet long. Two sets of pads work for different floors and dirt levels. The soft pads are great for general mopping and gentle cleaning for sealed hardwood floors, etc. that are prone to scratching. The scrubbing pads help with stuck-on messes. All pads are machine washable. The spinning heads propel the mop, so there’s no real pushing involved, which can lessen back strain. There’s a trigger to control the spray. You can even use it one-handed. It’s small enough to not take up a lot of space in your broom closet. This mop is the most expensive on our list. The propelling action can make the mop hard to control if you’re not careful. The mop heads may not pick up dirt well and can leave swirl marks on the floor. Note: Streaks may be due to hard water or use of a non-Bissell cleaning solution. Lack of absorption can be caused by washing with fabric softener. For nearly EVERY type of mop head/pad, you should avoid using fabric softener, as it greatly prohibits water absorption. Customers are a little divided on this one. Some love the propelling action since it prevents back strain. They love that the pads are machine washable. They like the two types of pads for cleaning wood, tile, and vinyl floors. Several customers reported swirl marks left on the floor. Others said the pads did not pick up dirt well or absorb water well. Again, these issues we suspect are user-specific (see the note above). Some didn’t like that it won’t reach behind toilets and other cramped spaces. 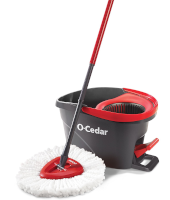 At first glance, the EasyWring Spin Mop & Bucket System from O’Cedar looks like just a simple mop and bucket. But if you look closer, you’ll notice several innovative features that make this spin mop (and your floor) shine. 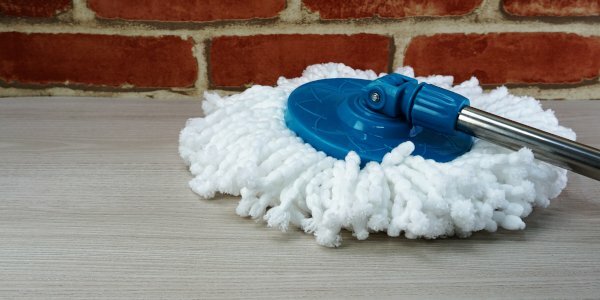 The mop head is made from fluffy, soft, machine washable microfiber strands, a material known for its deep cleaning action. Pop off the mop head and it’s a convenient dry duster, too. It’s one of the most affordable on our list, so you’re getting a good bang for the buck with this spin mop. The built-in wringer in the bucket is controlled with a foot pedal for truly hands-free wringing. It allows for good control over the moisture level in the mop for various types of floors and dirt levels. A splash guard keeps water from sloshing out as you go. 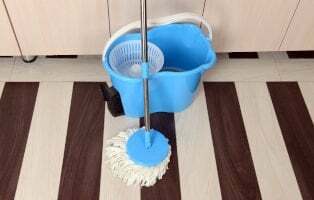 The triangular design of the mop head helps get into corners, while the flexible pivoting head maneuvers around tight corners well. The telescopic handle makes it more comfortable for taller people to use. The mop head is pretty small, which is great if you need to get behind toilets and other tight spaces. For a large room, however, it will take a while to get the job done. Extra mop heads are not included, but you can buy the microfiber refills separately. The bucket is lightweight plastic, but there are no wheels, so you’ll have to pick it up or drag it with you. Tip: Try putting the mop bucket on a large towel to drag so it’s easier on the back. Customers liked being able to wring out as much water as needed for their particular type of wood floor, which helped it dry very quickly. They also liked the sturdy metal handle. Some taller customers thought the handle was too short. However, many of them didn’t realize that it is a telescopic handle. Others reported the foot pedal on the bucket broke after a few uses. A few said the plastic on the mop head scratched the floor if they tried to mop too fast. The name alone is enough to get your attention, but the Mopnado is truly a force of nature in the land of spin mops. It’s average in price, but you get a lot of bang for the buck. With a 180 degree turning radius and a built-in soap dispenser, it’s built to make mopping a breeze. There is both a deluxe non-folding version and a compact version of the bucket which folds up into a 10 inch cube depending on how much storage space you need. An agitator in the bucket helps wash out the mop to remove dirt. The spinner and agitator in the bucket are both activated by pushing down on the mop, and it leaves the mop just as wet or dry as you want. Wheels and an extendable handle on the bucket make it easier to move around. There are two machine washable mop heads, plus a scrub brush attachment. The handle adjusts from 47 – 56 inches to accommodate folks of all heights. Since the mop head itself isn’t huge, you will need to rinse and spin it out frequently as you clean. It will also take a while to mop a really big room. In order to get the mop to spin, you’ll have to “unlock” the mop handle, which can be a little confusing at first. Attaching and detaching the mop head is done from a standing position, but that can take a little getting used to. The mop needs to be completely straight up in order to get it to spin. Customers love the agitator because it removes so much dirt from the mop. They like the sturdy stainless steel handle and the quick spin action that allows for controlled moisture level. Several customers reported not being able to get the mop to spin in the bucket. Keep in mind that you do have to keep the handle in the UNLOCKED position in order to spin it. Others said the plastic bottom broke from the handle. Mopnado doesn’t sell replacements parts. Tip: Look for videos from the manufacturer to see exactly how to operate the system. True to today’s “imitation is the best form of flattery” product trends, the Hapinnex is very similar to the Mopnado. But there are some noticeable differences. Hapinnex is red rather than green, for instance. It’s also quite a bit cheaper than the Mopnado. 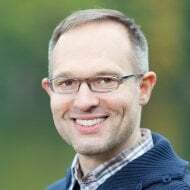 There have been quality control issues in 2017 involving handle breakage, but those seem to have been fixed. Budget-wise, the Hapinnex is a good spin mop to consider. Unlike a lot of spin mop buckets, this one has a spout on the bottom to empty water, which is easier and cleaner than dumping it out. There’s a bonus microfiber cleaning glove included plus an extra mop head. The 360 degree spin on the mop head and handle allows for good maneuvering around under furniture and tight spaces. The splash guard wringer basket keeps dirty water from spraying out everywhere. The built-in spin washer cleans the mop head well. There are no wheels or an extendable handle for moving the bucket around easier. So this will require quite a bit of lifting. The mop head is kind of small so it may take longer to mop a large room than with a bigger mop. There’s a similar learning curve to the Mopnado since you operate it in basically the exact same way. That can take some time to learn, so watching tutorial videos may help. They love the stainless steel handle now that it’s been updated for better quality. They appreciate the highly absorbent, machine washable mop heads and the extra one included. Customers had a hard time cleaning corners and behind toilets due to the shape and size. For some customers, the wringer basket didn’t remove as much water as they wanted. Others felt activating the spinning action required too much force to push the mop down. You’ve probably seen it on TV infomercials, but does the Hurricane 360 live up to the hype? Meh. It’s about the same price as the Hapinnex, but comes with a 5 year replacement warranty so perhaps it’s not as risky of an investment as more expensive brands. The mop is lightweight and easy to maneuver around. The bucket is foot-pedal operated like the O’Cedar EasyWring. While there are no wheels on the bucket, a specialized dolly with 360 degree wheels is available as a separate add-on. There are also optional blue microfiber duster heads available for wood floors, etc. The 5 year warranty is useful, and the company keeps their word in sending you full replacements if the mop breaks. There are no wheels on the bucket, neither is there an extendable handle for easier transport. All add-ons, like the rolling dolly, are sold separately. The spinning wringer is foot-pedal activated, but can break fairly easily. It seems there was an earlier version that was much better quality, which is unfortunate. This newer one has no fill line on the bucket. The fibers on the mop head are thinner and fall out easier. It’s also a lot smaller. Unfortunately, you may have to take advantage of the 5 year warranty more often than not. While it’s good they will replace the whole thing if it breaks, customers don’t like the inconvenience of having to do that. It’s a real shame that the newer version is of lesser quality than the original. Several customers were disappointed with that, having been loyal fans of the product before. For centuries, people have tackled the dreaded task of scrubbing floors. At first that meant down on hands and knees, scrubbing a soapy rag over hard stone. That resulted in painful conditions like bursitis of the knee, aptly nicknamed, “housemaid’s knee.” Later, yarn-head mops helped with the knee pain, but still resulted back pain and chapped hands. Thankfully, mopping has come a long way since then! Brilliant innovations in mop design have revolutionized floor cleaning. 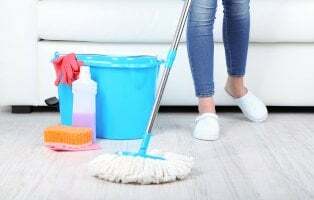 Twenty-five years ago, inventor Joy Mangano forever changed how we mop with her Miracle Mop, the first self-wringing mop that brought a collective sigh of relief from homeowners all across the US. Since then, thousands of other mopping products have hit the shelves. 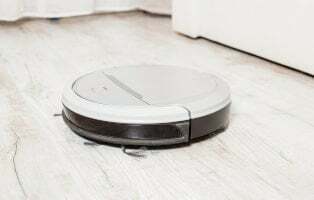 From simple self-wringing mops to robotic mops, we have a huge variety to choose from that fits into everyone’s budget. Spin mops are one just of those options. They are hugely popular for several reasons. Hands free mopping – the spinning self-wringing action keeps hot water and cleaning chemicals off your skin. Water control – most spin mops can be used wet or dry or anywhere in between thanks to advanced spinning technology. Quicker drying time – better wringing means less water left on the floor so you can get right back on it. It’s fun – okay, so mopping still isn’t at the top of our list of “fun” chores, but the spinning action can be fun to watch and the results satisfying. How do spin mops work? If you think back to science class, you might remember something called centrifugal force. That’s an inertial force that acts outward on an object moving around a center. The spinning baskets in a spin mop bucket use that centrifugal force to remove water effectively. Basically, the longer and faster you spin it, the more centrifugal force will push water out of the mop. So you can easily have only a slightly damp mop if needed. How you use a spin mop depends on how it’s designed. Some have foot pedals on the bucket that operate the spinning basket. Some are activated by pumping down on the mop handle. Still others are electric or battery powered. Fill the bucket then add your preferred cleaning solution. Dunk the mop head in the water, lift and place it in the spinning basket. Either use the foot pump or handle to spin the basket until the mop is as wet or dry as you want. Mop a section of floor. Some buckets have a built in agitator in the bottom that works like a washing machine. It works just like the spinning basket, but is used for rinsing out the mop. They’re usually quite effective too, so you’re not left with a bunch of dirt and debris in the mop that gets slopped right back on the floor. The best spin mops will make your life easier, not more frustrating. Ease of use may be your primary deciding factor. 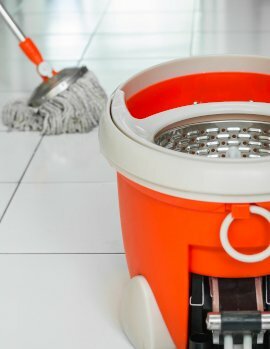 The bucket/mop system should be easy to spin, easy to rinse, easy to change mop heads, easy to maneuver in tight spaces, and easy to move from place to place. The spinning mechanism – Is it operated with a foot pedal or handle pump? Which would you prefer? Hardware in a foot pedal can sometimes be a bit flimsy, so keep that in mind. Agitator – This will keep the excess dirt out of your mop so you won’t have to change water or slop dirt back onto the floor. Soap dispenser – Though not a biggie, it can be more convenient to just fill up a built-in dispenser with cleaning fluid so you’re not having to scrounge around for the bottle. 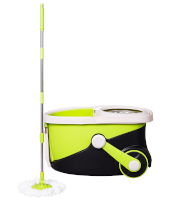 Accessories – Spin mops are pretty light when it comes to accessories. But some do come with scrubber brushes, cleaning gloves and extra mop heads that can come in handy. Drain plug – This is surprisingly not a common feature on spin mop buckets, but it should be. It makes dumping the dirty water a lot easier and less messy. Splash guard – One of these on the mop bucket will keep dirty and excess water IN the bucket where it belongs and not on your floor (or you). Wheels – If you still have nightmares about carrying around heavy buckets of dirty mop water that splashed all over your feet, wheels will be a dream come true. 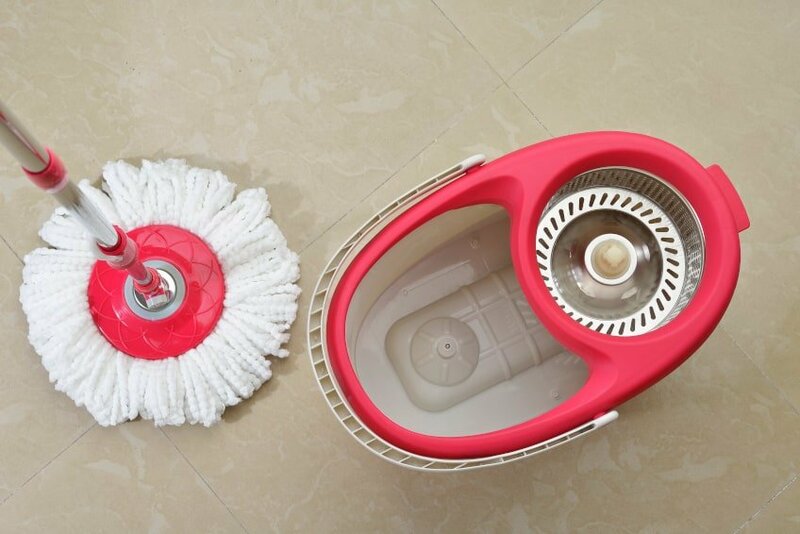 The mop itself is important too, especially the size and shape of the mop head. A triangular shape will usually clean corners better than a circular one. A larger mop head will clean a larger room faster, while a smaller one will fit behind toilets, under furniture and other tight spaces. There are other useful tips that a lot of people miss in the handle-pumped spin mops. They usually have a locking mechanism on the handle. It should be UNLOCKED for spinning/rinsing and LOCKED while mopping the floor. Angle the mop at about 45 degrees for general mopping. When spinning or rinsing in the bucket (and when changing mop heads sometimes), you have to keep the mop straight up and down at a 90 degree angle to the floor. If yours isn’t spinning correctly, make sure 1. that the handle is UNLOCKED and 2. that you have it standing straight up and not at an angle. As we’ve said before and will say again 50,000 times, always, ALWAYS sweep or vacuum before you mop. Also remember to check your flooring type. Wood floors, unless completely sealed, do not like water. Spin the heck out of that mop before cleaning hardwood floors. While researching customer experiences, we came across several good suggestions that we hope spin mop manufacturers implement soon.